Ampthill Town start their new season in SSML Division One on Saturday, bidding to make a challenge for promotion after relegation last year. 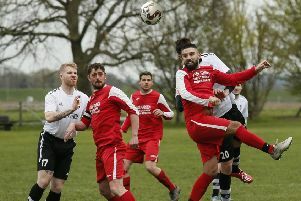 Town’s three-year stay in the Premier Division ended when they finished in the bottom two last season, despite a brave effort in the closing weeks which saw them fall two points short of Holmer Green. Ampthill have home advantage in their first three fixtures, with their first two games followed by an FA cup clash. Town host Southall on Saturday; the Perivale-based side finishing halfway in the table last term. Promoted side New Bradwell St Peters are the visitors next Tuesday and they will be keen to show their worth in what will be their first match of the season. Following two league games, Risborough Rangers are the opponents in an extra preliminary round FA Cup tie on Saturday week. Town will want to improve after an early exit last year at AFC Dunstable but Rangers have promised to bring a good following for their first game in the competition. Town have had mixed fortunes in their pre-season games, in which they have used many players from their squad. Most of last year’s staff have remained after an improving end to last term, but they have recorded two draws and three defeats from five games. Ampthill lost 2-0 at Olney on Tuesday and 3-1 at Eynesbury on Saturday when the hosts scored two goals in a 10-minute second half spell after Louie Dillon levelled an Eynesbury opener. A resolute performance saw them draw 1-1 at Newport Pagnell last Tuesday after a 5-0 home defeat from Cogenhoe, while their best display came in their first friendly when they were three up against Potters Bar Town before drawing 3-3. Manager Derwayne Stupple has used many players and formations in the games but it is time to get the selection right as Town embark on a new season in a new league. There are some established clubs and experienced players in Division One and it will be a tough ask to get among the promotion candidates.